Just a quick update today – so far many babies continue to survive. It’s still early – we’re just into the third day so far. Looking back at the last batch, I lost them around day 9 or 10. So proceeding cautiously on projections here. As of this afternoon, I can see that the numbers are lower than initially after birth. To be expected. Some die during molting, the larvae are carnivorous and will eat each other, and some just flat out die. That said, there are still hundreds or thousands of very active larvae swimming around that tank. MANY are clustered in the pockets of the reef rock. They seem to LOVE that reef rock. 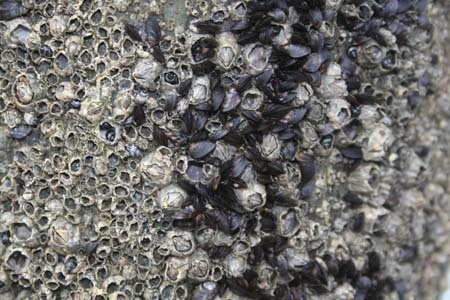 And another large group is clustered on the aragonite sand surface on the bottom near the heater. Just mystifying. The water, though cloudy, is clearer today. Water parameters remain as before – dead on target: pH 8.0-8.2, alkalinity and hardness 300 or more, chlorine, nitrites and nitrates all zero. I will retest the salinity later and see if I need to raise it just a bit more or if we are close enough to the 1.020 salinity mark. I continue to feed the Small Fry liquid food. This time, instead of the Kent’s Marine ZooPlex, I remembered I had frozen mini-krill in the freezer. I ground up a small amount of those and spread those around the tank. It appears many little black dots swim up to the granules of floating ground up mini-krill, then swimming off. So it at least seems like they’re chewing on the krill. I checked on the “brine shrimp hatchery” – it’s hard because if you turn off the air rock, everything still swirls around and the question in my mind was – “how do you tell swirling brine shrimp eggs apart from hatched tiny brine shrimp?” If I shine the light directly in the bottle, I can’t tell any difference. I noticed though if I looked in the bottle after shining the light indirectly (at an angle toward the floor), I could see shadows of things actively swimming around, as opposed to just eggs spinning in the water. So it seems the shrimp are hatching. I thought tonight I’d take a closer look and may siphon some of the shrimp out for tonight’s crab baby feeding. It will be interesting to see if the babies are up for catching live moving shrimps. They seem able to catch “floating” ground up krill so we’ll keep a good thought. This morning I came across a gold mine of information for writers – the blog for the editor of the Children’s Writers and Illustrators Market Guide from Writers Digest. As I said, a gold mine of information. Enjoy! And by the way, credit where credit is due. It was a comment of my husband’s that first clued me in to the fact that all was not well between Rosa and Dean…. The white cloud in the babies’ tank continues, yet the water quality is GREAT. What mystifies me is the absolute ?attraction the fiddler babies have for the aragonite sand and the reef rock. They swarm all over areas of the sand, stirring up clouds of dust, and bouncing down against the aragonite sand, then move on to another area. They are equally attracted to the reef rock, which is nothing more than a hunk of petrified coral. On the flip side, while they swim by the live rock, they do not seem to be interested in it to any great extent, even though there is a wide variety of algae growing all over it. 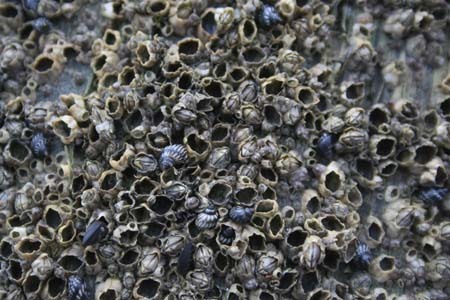 The aragonite sand is Seachem’s Meridian Marine Tidal Substrate. The reef rock is “Carib Sea Reef Rock.” Both products help to maintain proper pH and calcium levels, as well as encourage the growth of coralline algae and beneficial bacteria. In fact, I suspect it is the cloud of aragonite dust in the water that may have helped spur the bacteria on, resulting in the nitrite levels in the tank dropping to zero. It just seems counterintuitive to me, to have a tank of water I can barely see through, yet have it be so healthy by the numbers. I shine the flashlight in the tank and can see thousands of babies swimming around, digging in the sand, or clustering on the reef rock. All are in motion, so they are most definitely alive. I have to wonder if there are already lots of microscopic algae on the surfaces of the sand and the reef rock, and the congregating of the fiddler babies is about eating what’s there. I am currently feeding them 4 drops of Wardley’s Essentials Small Fry Liquid Food and a 1/4 tsp of Kent Marine’s ZooPlex, 3 times a day. I’m being very careful not to overfeed, and monitoring ammonia and nitrite levels 2-3 times a day. I’ve also started the live brine shrimp hatchery going, though I have to say, I’m not sure if that’s something I want to deal with on a regular basis. Just one more job I have to do and as one of the sites mentioned, if you can’t get live food, frozen brine shrimp is the next best thing. I know I saw cubes of frozen brine shrimp at PetsMart and I may yet change to that. But for now, I’ll see the “sea monkey” hatching project through and see how it goes. I expect I’ll have hatched brine shrimp by tomorrow so I will try some of that instead of the liquid feeds and see what happens. Just as an aside, I found a page on About.com that mentions their top picks for “small fry” food. While these are primarily small fry as in baby fish, they all contain the multitude of nutrients need, and in an accessible, easily digested liquid form for young aquatic creatures. So I’m not too concerned. Frankly, even though the Kent Marine ZooPlex is supposed to be for larval invertebrates, I have to say I’m more happy with the “dispersal” ability of Wardley’s Small Fry food. Wardley’s is a milky liquid that spreads completely and uniformly through the tank, so the most food and nutrients are available to the most number of critters. The Kent’s on the other hand, is like ground up bits of brine shrimp in a pink liquid. The instructions say a teaspoon per 50 gallons, and since I’ve only got a 10 gallon tank, I am giving 1/4 tsp of the stuff. However it seems like precious little food, that probably isn’t getting to anywhere near the number of baby fiddlers that are hungry and needing to eat. So at least so far, I’m not that impressed with the Kent Marine ZooPlex and will stick primarily with Wardley’s. From there it’s live or frozen brine shrimp. I raised the salinity of the aquarium yesterday to 1.017 from 1.012. I’d be happy to get to 1.020, which is close enough to a marine environment. I’ll leave it there for a couple weeks then, and gauge the appropriate time to lower it back down to brackish. I want to match that to the development of the more advanced crab forms from the initial larval stages. Anyway, so far, so good. We’ll see how this progresses over the next few days. It would be nice to keep many alive to actually make it to adult crab stage. Stay tuned! Even though the weather today has taken a turn colder, I know summer will come, so…some more ocean shots, only this time, at the “micro” level. I was amazed to see babies born before Monday. Monday was 2 weeks to the best of my knowledge. So she delivered a couple of days earlier than I expected. Anyway, yesterday started with me doing a 30% water change as nitrite levels in the tank since Scarlett has been in there, have been hovering between 0.5 – 1.0 ppm. I kept the water filter running to give the water the best chance of staying nitrite free and letting the nitrogen cycle mature. This evening though, I noticed that Scarlett was very agitated. She kept running back and forth in the tank, climbing up onto the air bubbler and waving her claws in front of her as if trying to spread something in the water. There did not appear to be anything in front of her though. I noticed that the center of the egg mass seemed to be swelling. Given that, I went ahead and shut off the water filter. For the next hour or two, Scarlett O’Hara kept moving around, seeming very uncomfortable. Around 8:30 p.m. I looked over at the tank and noticed she was sitting quietly in the front of the tank eating. She seemed “slimmer.” Looking closer, I realized, she no longer had the egg mass. So I missed the delivery again. However, a quick look around the tank and I could seen thousands of tiny little dots swimming around. I fed them a small amount of Small Fry and ZooPlex. I wondered if this will go okay since I couldn’t get the nitrites to zero before they were born. This morning I got up and looked at the tank. It was a white cloud. I thought, “Oh God, the water quality got worse with all the babies in there and the nitrites are probably through the roof.” I looked at the ammonia monitor and it is in the safe zone. I shined a light into the white murk and could see thousands of babies swimming around. So they’re still alive and ?healthy. pH 8.0 – good; alkalinity 300, hardness >300, chlorine 0 – all great results, AND the REAL KICKER OF ALL: NITRITES AND NITRATES ZERO!!!! Puzzled, I repeated the nitrites test using a tube test instead of the dipstick. Again – nitrites are ZERO!! So water quality is actually BETTER??? I looked in the tank and saw all the babies flitting around and MANY on the calcium sand at the bottom. That’s when the light bulb went off in my head. The water cloudiness is “white” like the bottom sand….could it be cloudy because thousands of little tiny guys are bouncing around against the sand at the bottom, eating whatever’s in it (since it’s ground up from live coral…possibly some microscopic food bits there? ), and eating it for calcium for their molting? If they were out in the ocean they’d have “bottom stuff” to dig around in so maybe this is a good thing? Though it certainly makes it harder to see them. For whatever reason, baby fiddlers seem to like to “head for the bottom” – at least some of them. That happened last time with many burrowing into the gravel and dying. So I will see how this calcium sand thing goes. I am PLEASED though that the water quality is so good. For today – I need to go feed them again and I will need to start raising the salinity to ocean level. If that IS what should happen, they should survive. If not, well, we’ll find out. One step at a time. The Gift – Fiddler Extra!!! We’re Grandparents Again! Just a quick post tonight to announce the birth of another 100000 fiddler babies!!! Mother is doing well and is back in her regular tank. Babies are swimming around like crazy and have been fed some liquid Small Fry food and a few drops of Kent Marine ZooPlex. I’ll give a more full report in the morning. You are currently browsing the Soul Mosaic blog archives for March, 2008.